The short version of Pulled Loop shows the pattern of five loops quite well. The pattern is similar to a Fenton one, Boggy Bayou, which has eight loops or arches in each panel. Most Pulled Loop vases are in the 9 to 12 inch height range. 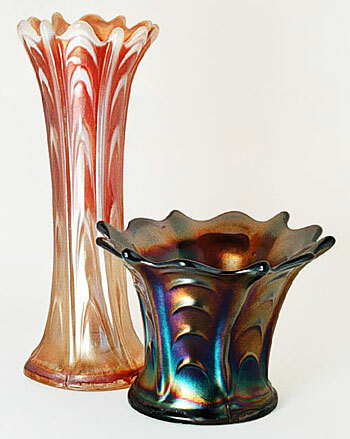 The scarce short examples were made by Dugan (with the larger base diameter) and are usually purple, with a few in white. At least five different moulds were used for Pulled Loop vases with base diameters from 3 1/4 inches to just under 4 inches.